When we think of childhood, we think of carefree and happy times, with multiple social outings and birthday parties, and school years marked by achievements and success. Unfortunately, for a very small group of children and their families, their realities are much different. These are kids whose childhoods are marred by feelings of increasing anxiety and social isolation. They can hallucinate and have extremely violent behaviors. These same children can even hear voices that they say are from faraway places or even feel that somebody is chasing them. They cannot succeed in school. They don’t sleep well. These children have childhood schizophrenia. 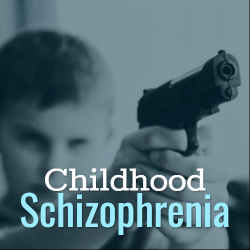 Childhood schizophrenia is extremely rare. It is estimated that it occurs in less than 1 in 10,000 children younger than 13, but as you reach the teenage years and later, the numbers become more comparable to the prevalence found in adults – 1 in 100 people. Studies demonstrate that its prevalence is almost the same in developed countries around the world. Presently, there are no studies of prevalence of childhood schizophrenia in underdeveloped countries. We also don’t know prevalence among ethnicities and race. It is more common in males than in females, with an approximate incidence of 2:1. However, we do know that the younger the child is, the more difficult it is to diagnose due to its insidious presentation. In addition, the younger the child is at diagnosis, the worse their prognosis. Early on, these children may present simply as a child with developmental delays. They present with speech delay, or delayed walking, or even hand flapping or rocking. However, these symptoms are also quite common in children with autism spectrum disorder. It may not be until much later, when the more commonly recognized symptoms of schizophrenia present, that these early developmental delays may be foretelling of a diagnosis of schizophrenia. Not surprisingly, due to autism’s and childhood schizophrenia’s similar presentations, a study conducted by NIH demonstrated that nearly 30% of youth diagnosed with childhood schizophrenia also had a diagnosis of autism. More studies are being conducted to help further differentiate between these two entities, as well as further identify their genetic etiologies, and in turn help provide better treatment and hopefully allow for prevention in the future. As the child gets older, other symptoms start to present: school performance issues, lack of motivation, withdrawn and depressed behavior, trouble sleeping. All of these symptoms are commonly reported by many families as “typical” teenage behavior. Even during the teenage years, it continues to be a challenge to appropriately diagnose these children. As the child continues to age, then the more typical presentations of delusions, hallucinations, disorganized thinking, extremely disorganized or abnormal motor behavior, or negative symptoms (the inability to show emotion, motivation, or pleasure) come about. Unfortunately, over time the symptoms do get worse and more obvious; even culminating in a psychotic break. No single cause has yet been found for childhood schizophrenia. It is thought that childhood schizophrenia can be caused by both genetic and the environmental causes. As adults, these children will have fewer social relationships, less academic achievement, less job retention, less ability to live independently and a higher rate of suicide. Treatment includes medication, psychotherapy, social and academic training as well as vocational rehabilitation, and hospitalization. Priority is to keep the child safe: safe from hurting themselves or others. If there is a crisis, a hospitalization may be inevitable, as the hospital may be the safest place for that child. This can entail medication use as well as proper safety later in the home. Families will need to be thoroughly educated about the natural course of childhood schizophrenia, along with information regarding treatment and possible complications in the future. Families need to be taught to be able to recognize the danger signs. Affected children as they get older can also be taught to recognize an impending relapse. Families of children and youth with childhood schizophrenia need lots of support. It is key for any family with a child with any suspicious signs or symptoms described above to seek medical advice. For example, when the child present with developmental delays and is seen by their doctor, they would be referred to appropriate specialists and early intervention services such as speech, physical and occupational therapies in addition to a structured environment. These interventions will help the child with their ongoing social interactions and developmental delays. When the teen presents with a depressed or withdrawn mood, a physician will refer to psychotherapy and/or counseling. In the end, it is important to note when your child or youth displays changes in his or her behavior and to bring these up quickly to your pediatrician. When that diagnosis of childhood schizophrenia is finally made, specialty care with a psychiatrist experienced in the treatment of childhood schizophrenia is imperative. Ongoing care with the psychiatrist and his or her team of psychologists and social workers will be extremely beneficial. Families are also encouraged to join a local support group, seek individual psychotherapy (for parents as well as the affected child) and for parents to take time for themselves. Helping families as a whole unit will allow the family to better take care of their child.